Update: The New York Times is reporting that Amazon is nearing a deal to move to Long Island City in New York and Crystal City in Arlington, Virginia. According to the WSJ, Amazon has decided to split HQ2 evenly between two different cities with 25,000 employees each. The reason is to ease concerns about being able to recruit enough talent, while also not putting as much pressure on transit and housing. A final decision on the two cities has not yet been reached, but an announcement could come as soon as this week. Bezos visited Miami twice – Flight records of Jeff Bezos’ private jet shows that he has visited Miami twice this year. Other cities on the HQ2 finalist list that have multiple visits from Bezos are Washington D.C., Los Angeles, New York, Boston, and Dallas. Cities that have no visits from Bezos include Chicago, Atlanta and Austin. Runner up cities could still get something – some people with knowledge of the situation believe Amazon will place smaller operations in runner-up cities, the WSJ reported. Richard Florida speculated on Twitter that Miami could get a Latin America HQ either way. I’ll take the LATAM HQ in Miami. You know that LATAM is one of the largest Latin American airlines. I remember watching Besos in an interview earlier on this year on TV and as he began talking about HQ2, I remember distinctly he did say he wanted it to be in a city that would be middle of the road, giving the employees the inspiration to work and not have too much distraction. Now I love Miami but “middle of the road” is not the way I would describe it. And “not have too much distraction” …. well, what can I say, this is Miami. I would love it to be built here but if he really feels that way, I just don’t see it. Bye Amazon H2 for Miami. BESOS A BEZOS. Right,because Miami has so many more distractions than the New York Metro area?…you country azzes on here always giddy and talking sh*t.
It is obvious that you are the country azz who does not get out of your mom’s house much. HQ2 is going to Long Island where I lived for over 5 years, that area much like Crystal City in Virginia, where two of my brothers still live, are areas that have much less distractions than Miami, and where work can get done. If you don’t agree with that save enough bus fare and go see for yourself. It is now obvious that Bezos feels the same way. Miami had a good run but it looks like now it is over now. It’s not “Long Island” but “Long Island City” which are 2 completely different places in NY… As Long Island might not have many distractions, as you say. Long Island City has plenty and it’s 5 minutes from the busy Manhattan where “distractions” are definitely more than Miami. But regardless, if you have a job and are in your office doing the job you are paid for, how are you going to affected or distracted but what the city has to offer? Are they going to hire adults or what? Are you really comparing Long Island City to South beach in terms of distractions? Seriously? Come on, you know better than that, lol. What? Last time I checked, Long Island City is in West Queens, which is on Long Island. I never understood New Yawkers calling only Nassau and Suffolk Counties “Long Island,” despite over half of NYC’s population residing there in the first place. Long Island city in queens. Nothing to do with long Island. Cool at least Miami will end up in the top five after all the so called “experts” placed in the bottom of the top 20 list. Great, we are No.5. Loser talk. In his heart he knows he needs to be near DC. 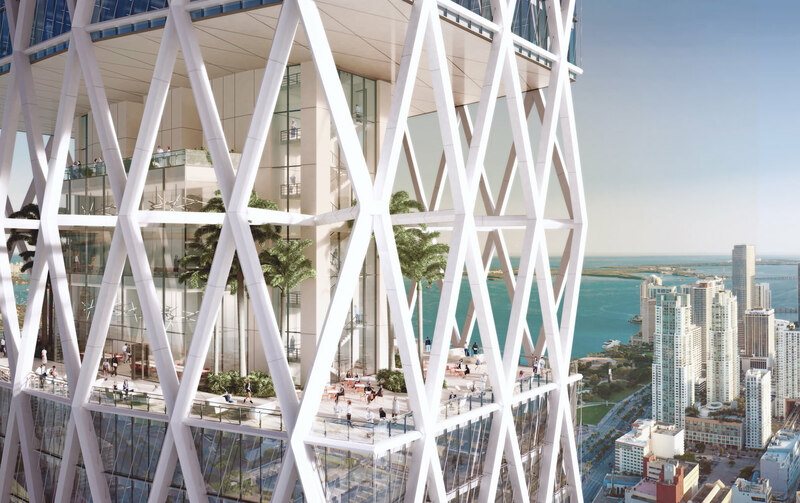 It’s a Class A Office Tower by Hines, to be built to the north of the Paramount Miami Worldcenter amenities podium. A great design! It will be very hard for Miami, which is located in a County and state which refuse to invest in a modern and reliable mass transportation system, to be picked for a project this size. Leeson to learn here: Make sure you vote in our next local elections. The so called lack of tech talent is relative. Miami has a thriving start-up scene in tech already. Moreover, Amazon will have zero issues attracting the best of the best tech talent to Miami. For the price of a dump in Astoria or LIC you can live in a luxury building in Brickell soaking your techy testicles in the hot tub 12 months out of the year. Btw…Amazon already has a good presence here in MIA. You’re right, it is relative, and relative to other top contenders Miami’s knowledge-based sector is rather small. It is growing, but slowly and intermittently. A company the size of Amazon doesn’t want to wait for qualified workers to arrive. They’ve made it very clear that they want to hit the ground running in a city that’s ready now and that will have the amenities to attract and retain additional top talent. Condos and a tropical climate are a small part of the equation. I lost hope that it will be in Miami… It has already been leaked by a credible source that it will be in Crystal City VA. If this is true Amazon can kiss my backside! Hopefully they at least build a portion of HQ2 in Miami, HQ2 Latin America… I think it makes a lot of sense. Bezos would never allow himself to be at the mercy of a Gimenez or a Suarez. Who would choose that? Yes but thank God we do have E11even. A santero in Hialeah told me that Miami won’t get the Amazon H2. Miami doesn’t even have enough available office space to park the employees until a new headquarter is finished. They aren’t hiring 50k from day one so please relax with the negativity. never said 50k, if you read other articles they are looking to house several hundred in the beginning and Miami just doesn’t have a critical mass of office space for any company to move down here. wow!…I wont even reply on the subject if you think the metro rail is plenty. Mind Blown! Let’s pretend for a moment that Miami has a perfect metro system. Are you telling me you will be riding the ‘subway’ when it is 95 degrees and 100% humidity and walking 5 blocks to your work from the nearest subway stop means you are soaked in sweat? What we have is a dysfunctional public transportation system and incompetent traffic engineers and planners. Downtown Miami is a nightmare during peak rush hour traffic and it is only going to get worst with the construction of SR 836. Unfortunately, Miami is no draw for large corporate firms. agreed. we need more parking garages. We desperately need 50000 more geeky tech people with bad teeth and hygiene. Sick and tired of the beautiful people here in Miami. You’re just mad because these what you call, “geeky tech people with bad teeth and hygiene,” are smarter than you.